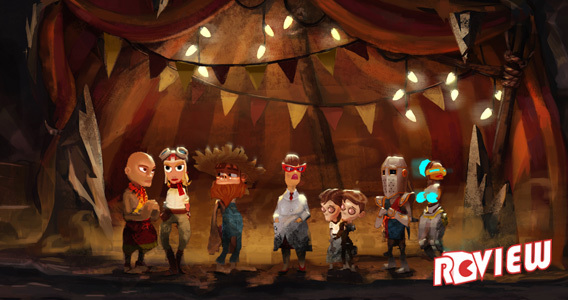 Telltale Games picks up the ball where the DeLorean fueled film trilogy ended years ago, bringing a Hollywood franchise into their niche playground of point and click adventure. 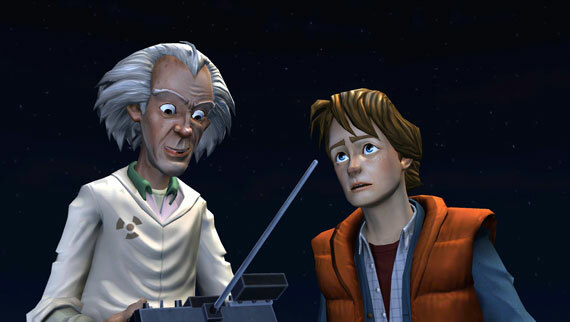 If you’ve “been there and done that” with Telltale’s many releases to date, Back to the Future is certainly a curve ball. 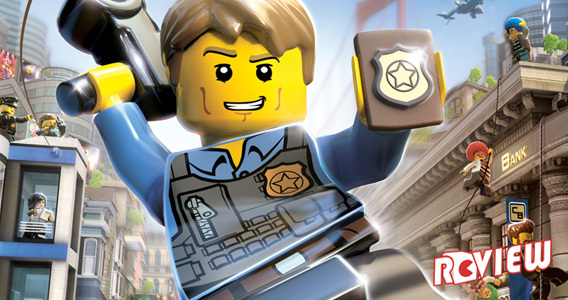 Significant expectations ride on the release of this first episode given a legacy of lackluster conversions of films to the gaming medium, predating Back to the Future’s own awkward release to the NES – back during an era where every film franchise was fair game for pixelated exploitation. 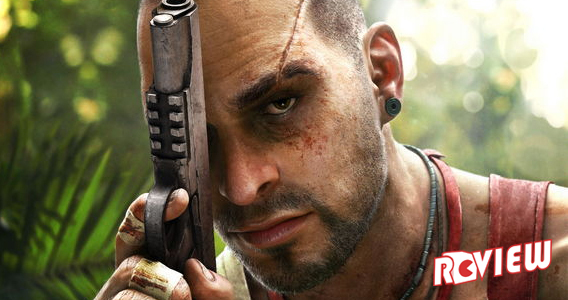 Gains have been made in creating richer gaming spaces from such properties, but plenty is still wanting from the bigger development studios typically in control – so double up those expectations yet again on a smaller studio such as Telltale. But let me spread the good news that the game immediately exhibits the touch of hands belonging to fans, who, fortunately for us, also know how to stitch a game together. From the outset the release offers gamers a lift back to the world of the films, where Doc launches into an apocalyptic spiel about the fabric of space and time at the drop of a hat, and Biff remains the biggest jerk this side of any time period. 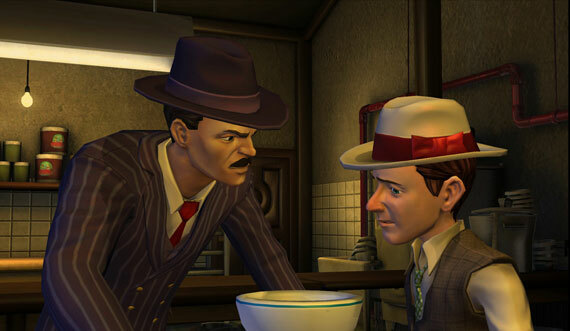 In establishing the ground for the five episode adventure, Telltale carves their own space by traveling back to the 1930s, where prohibition drives the events of the town and elder characters in the eighties are found on the cusp of establishing their identities – paying consistent attention to a theme integral to the films with the duality of characters at differing times in history. As with the films, the citizens of Hill Valley and the McFly of the day cower to the bullying of a humorless Tannen, and in a fresher take a young Doc Brown is just discovering his lifelong career in science – ridiculously fantastic film styled science of course. The game isn’t much for wasting time on introductions. 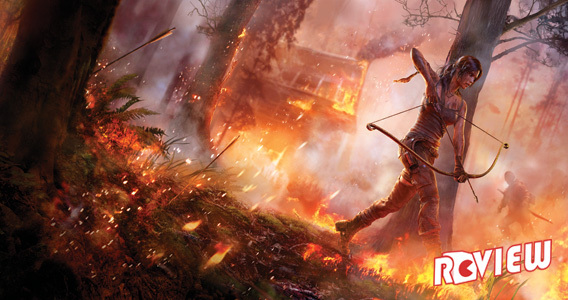 Even with some lingering I was finished on the short side of three hours, owing to the way the game is tightly focused on driving the narrative forward. 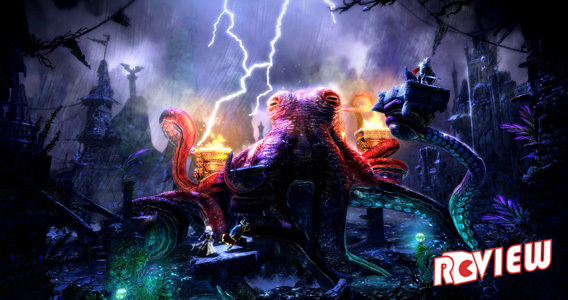 As a result, the player is moved through a series of small areas where characters and objects await investigation, and integration into overarching objectives. Even when allowed to roam around the town, there are still only a few buildings Marty can enter, namely the ones where business awaits the player’s to-do list in helping Doc with his latest time traveling misstep. Everything is very straightforward, there’s no space for random objects in the inventory, and inventory items are single serve – in that they don’t offer space for mixing and matching with one another. Items are still important for solving problems, but the key comes from conversation trees. More often than not, puzzles move forward when the player discusses new revelations with characters in order to set more events in motion. The game is far less about complex puzzles that stall the momentum, but still finds space for a few “aha!” moments along the way. At first I found that discouraging, because my love for the roots of Telltale’s formula is fed by games that asked me to wander around picking up completely random objects. In reality however, plenty of those adventures found me simply jamming objects at problems with no real appreciation or focus on the situation. 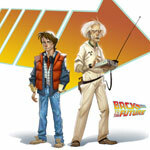 Right or wrong, my sense of Back to the Future’s first outing involves carbon dating myself, suggesting that it strikes significant middle ground between the crazy object filled games of my youth, with say Maniac Mansion, and the overwhelming amount of conversations and wanderings in games that have since tried to evolve that formula. 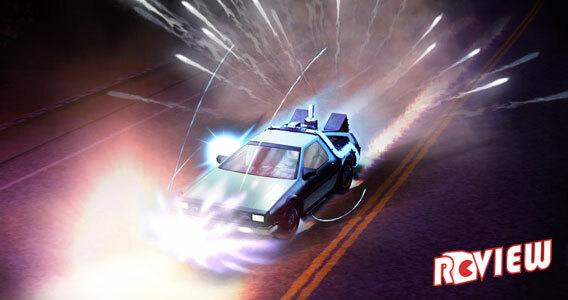 Back to the Future’s momentum and scale saw me finish the game quickly, but also never frustratingly caused me to break away from the experience for air, pulling me along without pause and sadly causing a very good cup of tea to go cold. This really owes to Telltale giving space for Back to the Future to stretch and exercise its shtick within their gaming space, creating action sequences with a puzzle layer well captured in the final moments of this episode. There were times where this felt less physically interactive even while walking around town, as if I were a passenger rather than an active participant. Ultimately that issue is left teetering on the player’s value of the more flowing and filmic game at work, but Telltale’s writing and wit proves sharp as ever toward alleviating the concern. 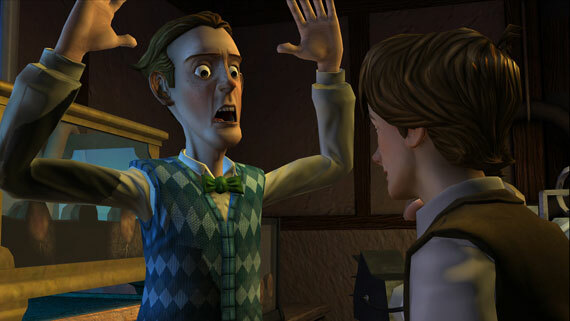 There’s a brilliant sequence where Doc is arguing in another room, but also giving Marty clues to continue a delicate scientific procedure by emphasizing words while arguing, a sequence that demonstrates how Telltale is on the money for capturing the humor of the films while also giving players a hand in driving it forward – not just by causing events, but also by learning about what drives the people involved in them. I remain several shades of melancholy that it goes by so quickly, but being left wanting more shouldn’t cause Telltale to lose any sleep, particularly as the cliffhanger ending does well convincing me that this ride should manage to hit that elusive 88mph as it continues. Nice review Jamie. I’ll be trying this in january when my complimentary copy of Episode 1 will be available for download. Telltale just keep getting better and better at devepoling this type of game.